It has been speculated, but this week it went from the assumed into the effectively announced: small factions of younger members of the Muslim Brotherhood are finding their way to join the most recent and harshest version of political Islamic militant groups: Islamic State (IS). The frontpage story of the Cairo daily Al-Shorouk by Muslim Brotherhood expert-journalist Mohamed Khayyal quoted informed sources within the oldest political Islam group of a limited but significant split of a small group of younger Muslim Brotherhood members from the mother organisation after having lost hope that their organisation would be spared the 'systematic security persecution' that has been unabated since the ouster of the Muslim Brotherhood from power on 3 July 2013, following 30 June nationwide demonstrations calling for President Mohamed Morsi, a leader of the group, to step down one year after having assumed his position. “It was coming round the corner for a few months,” said a source close to the Brotherhood group. “There has been recently voices within the group suggesting that the Muslim Brotherhood is being treated from state and society as a terrorist group when it is not, and that if the members of the group know they are designated militant anyway, then they might as well pursue the militant path,” he added. “In fact, this is the prime choice of the Muslim Brotherhood and it was only put aside when the group felt it was either too costly from the security perspective, or un-needed from the political perspective; but this is what they believe in anyway,” Ban argued. The story behind this recent development, in the minds of some members of the group and also in the minds of some of those close to Muslim Brotherhood circles, started on the eve of the ouster of Morsi from office. 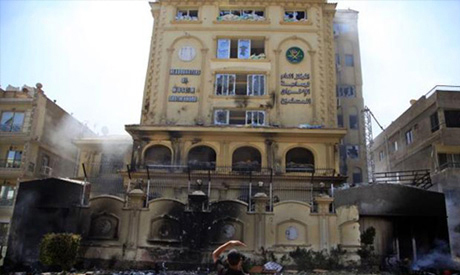 “At the time, there were young members who were openly saying if the Muslim Brotherhood was feared, things would not have taken the path of 30 June — what they thought was an orchestrated attempt to remove Morsi by state institutions that were still faithful to the pre-25 January rule,” said a political activist who used to meet with members of the Muslim Brotherhood and its now defunct political arm, the Freedom and Justice Party (FJP). “And actually, there was a considerable group within the Muslim Brotherhood at the time that was completely disappointed with the performance not just of Morsi but of the entire leadership; they found that the leadership was involved in a very unfortunate mix of political arrogance and political immaturity,” the same activist added. Another activist, who is also close to Muslim Brotherhood quarters, argued that up until the day of the dispersal of the Muslim Brotherhood sit-ins on 14 August two years ago — with subsequent bloodshed — there was a trend in the Muslim Brotherhood that was pressuring the group leadership to pursue compromise. “But it was not happening and it was not going to happen and today we can all see that it was not going to happen,” said a European diplomat who was party to a large working European Union mediation mission that aimed to find a peaceful exit from the political crisis of summer of 2013. “It was clear that [the strongest man of the group] Khairat [El-Shater] was not going to budge and that also [the then minister of defence and now President Abdel-Fattah] El-Sisi was not going to budge,” he added. Political scientist Ahmed Abd Rabou agrees that the militant confrontation between the state and the group, which climaxed on the day of the dispersal, with previous confrontations in the weeks leading to the dispersal, offered a perfect setting for a sense of true victimisation — “despite the many issues that one could take against the performance of the Muslim Brotherhood, and in fact against their very political choices” — in wide circles of the group. What followed, said political figure Amin Iskandar, was a consistent process of throwing salt on the wound. “The security choices of the state against the Muslim Brotherhood, whose ouster from power was the people’s will and not just the scheme of the state establishments, as they may wish to think, were disastrous to say the least, with incredibly unchecked roundups and harsh imprisonment conditions of many of the members of the group, from the leadership down,” Iskandar said. According to Abdrabou, the fact that the Muslim Brotherhood was being subjected to unfairness is only one part of a set up that produced the mood for radicalisation within the group, which had always taken pride in being the one Islamist group with the least tendency to resort to violence throughout its history. “The other and perhaps more disturbing part was the full galvanisation of politics that the state imposed on all political trends, Islamists or not, under the banner of the war on terror,” he said. “Any serious attempt to combat terror should not allow for such a ferocious attack on public and political freedoms; nor should it allow for the disturbing violations of human rights of Islamists in detention, in prison and those who are running to escape the security roundups,” Kandil said. “Historically speaking, the Muslim Brotherhood had shown tendencies to fully embrace violence and instead of taking them away from that path, the state painted them exactly into this corner,” Kandil said. Informed legal sources with direct inroads into the Muslim Brotherhood speak of a mass exodus of the Muslim Brotherhood from Egypt to many countries. “Some left without having enough money and without having said goodbye to their family members,” said one. “And of course we have the accounts of the very disturbing imprisonment conditions of the Islamists that have been surfacing during the past few weeks,” Kandil said. “This is a very disturbing situation that is having a negative impact on the whole Islamist movement and not just those of the Muslim Brotherhood,” said Ashraf Thabet, a leading figure of the Salafist Al-Nour Party that sided with the ouster of Morsi and has been close to the ruling regime since. “I am afraid we are to relive the 1990s. I am actually concerned that things might be much worse than that,” Iskandar said. Abdrabou agrees that while the Muslim Brotherhood seems set to embrace a long and slow process of radicalisation that would take the currently fragmented group to abandon the path of political engagement that it adopted after its confrontations with Gamal Abdel Nasser in the 1960s and through subsequent decades until the election of Morsi in June 2012. “We are not going to see the Muslim Brotherhood dissolved or dead, as some may wish, but we are going to see a group that reformulates its structure and its doctrine upon a highly radical concept,” he said. Political scientist Hassan Nafaa, who had upon the ouster of Morsi and prior to the dispersal of the sit-ins proposed an initiative for a democratic path, fears the elimination of any chances left for picking up the pieces of a democratisation process. “I think we will need more time to carefully examine what is really going on inside the Muslim Brotherhood and how far and fast the radicalisation process would go, and if this process would eat at the strength of the organisation itself,” Nafaa said. However, he added, it would be hard to think that the process of radicalisation is insignificant, or that the Muslim Brotherhood are in any position today to find their cohesion and opt for any initiative on dialogue with the state. During the past few weeks, informed diplomatic and political sources spoke of several attempts by Qatar to host consolidation sessions for the Muslim Brotherhood, or Saudi proposals for a limited reintegration of the Muslim Brotherhood in Egypt as part of a wider role that Riyadh is planning for the oldest political Islam group, in its Sunni capacity, across the Arab world in the face of what the House of Saud fear is the growing influence of Iran and the Shias. There is no next for the Muslim brotherhood terrorist. No society allows terrorists room to function, flourish. In case anyone forgot the largest demonstrations against the brotherhoods puppet Morsi were loud and clear. Louder then the explosives the Muslim brotherhood terrorists plant to kill fellow unsuspecting Egyptians. The Core MB has been oscillating between going underground and above ground for decades and will continue to do so for more to come; they could be contained. A more important questions is what is next for Egypt? The Egyptian government has 3 choices: (1) continue the crusade against the MB and other religious groups; this will have a “perception” of winning the battle on the surface but it will throw millions of angry youth to the Arms of IS outside and inside Egypt. (2) Compromise and allow religious parties to run for office, which would be a mistake because they will turn Egypt into a poor Saudi. (3) Cut supply lines to the MB by preventing millions of Egyptian Youth to join their cause, not by banning protest or jailing activists; but by (a) Creating a serious economic plans to enable the 30 million Egyptian youth to succeed, and (b) Liberalize religion; no one will be targeted for following Sunni, Shia, Christian, Jewish, or no faith. More oppression from fascist regime is only going to make MB more powerful. Let's face it, never have high expectations from a terrorist organization. The Muslim brotherhood has been a failure from its inception, we all know that. As terrorists you think they have an ounce of morality to look anywhere beyond fellow terrorists to emulate. They actually think IS is success story. Never mind the wholesale death they cause on others and themselves. These mindless people are so miserable with themselves and their sorry lives, that death is their goal in life. Can anyone sink any lower?? ?